On Monday, August 21st, a solar eclipse was visible across Central Ohio. 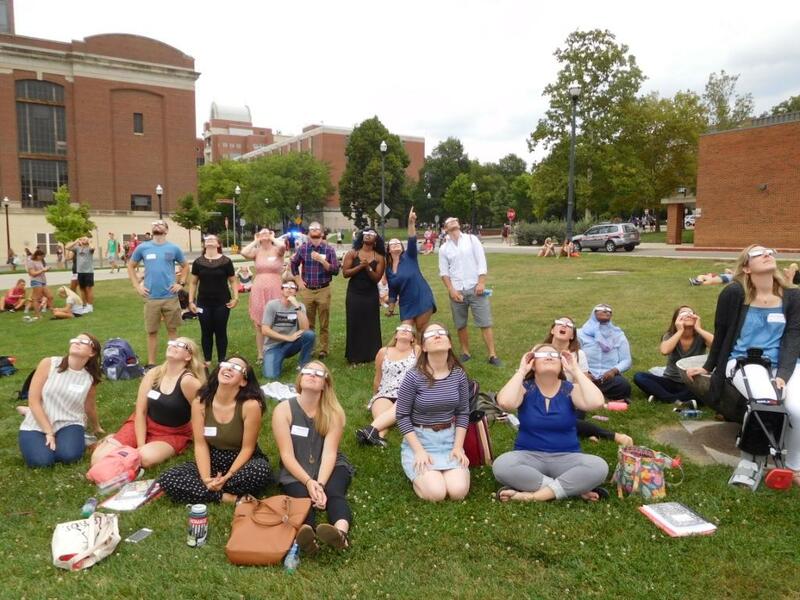 Through breaks in the clouds, students, faculty and staff of Ohio State watched from the top of parking garages, on the oval and scattered along sidewalks as an ominous darkness covered campus. 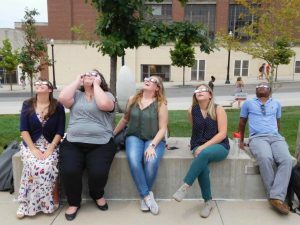 The importance of not looking directly at the eclipse and using protective eclipse glasses had been stressed on the news for days leading up to the event. 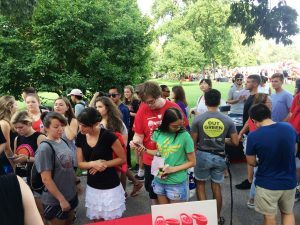 The OSU Suicide Prevention Program decided to combine the need for this safety precaution with a campaign to promote their important mission. 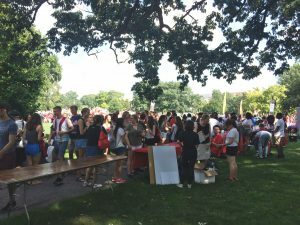 The OSU Suicide Prevention Program distributed 1,300 pairs of licensed eclipse glasses at the Student Involvement Fair. 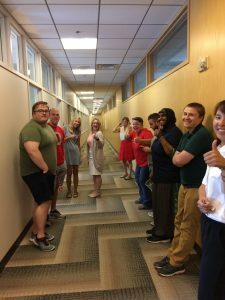 Another 700 pairs were given to faculty and staff who have been involved in suicide prevention efforts in the past (REACH, RUOK? 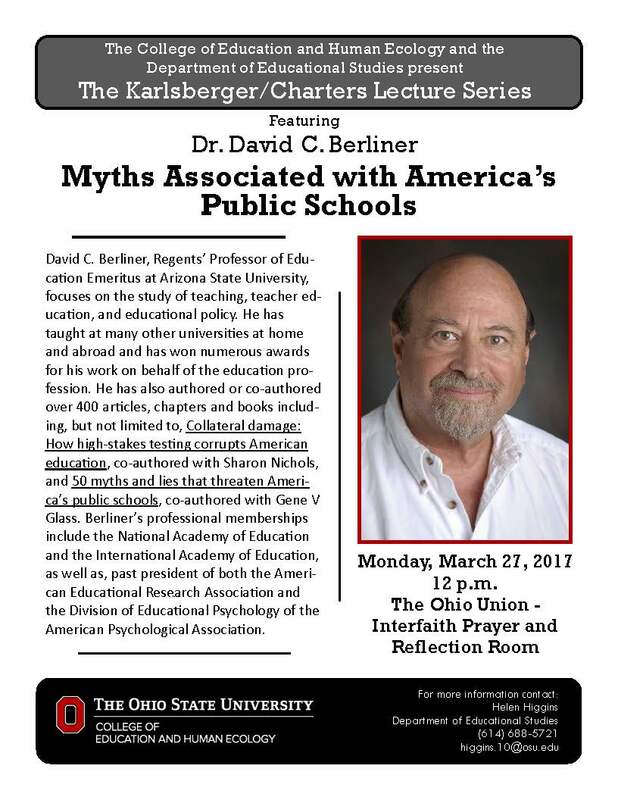 Buckeyes, advisory boards, STEP faculty mentors, etc.) The glasses were given out along with the slogan Bringing Suicide Prevention Out of the Shadows. Students had to follow @OSUREACH on Twitter, Instagram or Facebook to receive glasses. This effort brought attention to the important work of the OSU Suicide Prevention program and helped to bring suicide prevention to the forefront of students’ minds. The Counselor Education program is pleased to announce the opening of the OSU S.M.A.R.T. Lab (Stress Management and Resiliency Training). Tomorrow- Wednesday March 22nd, there will be an open house from 1-4pm. Stop by and see what’s goin going on in our clinic space on the 4th floor of PAES! Check out this article in the Lantern! The College of Education and Human Ecology’s Office of Diversity, Inclusion and Community Engagement (DICE) invites you to attend a screening and discussion of the award-winning educational documentary, Tested. The filmmaker, Curtis Chin, will be attending the screening and leading a Q&A after the film. Refreshments will be served. RSVP below to attend. About the film: The gap in opportunities for different races in America remains extreme. Nowhere is this more evident than our nation’s top public schools. In New York City, where blacks and Hispanics make up 70 percent of the city’s school-aged population, they represent less than 5 percent at the city’s most elite public high schools. Tested looks at the important issue of racial diversity and public schools by following a dozen families in New York City from different racial, socio-economic and religious backgrounds. The film follows along as they prepare to pass the grueling standardized test to get into one of the city’s best high schools. The film includes the voices of such education experts as Pedro Noguera and Diane Ravitch as it explores such issues as access to a high-quality education, affirmative action and the model-minority myth. Register to attend: click here to register. 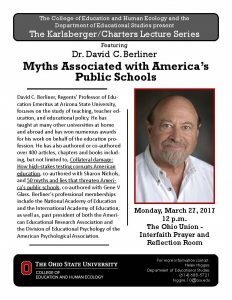 RSVP by March 22nd. Questions: Contact Nicole Luthy, Director of School Outreach and Engagement, at luthy.22@osu.edu. 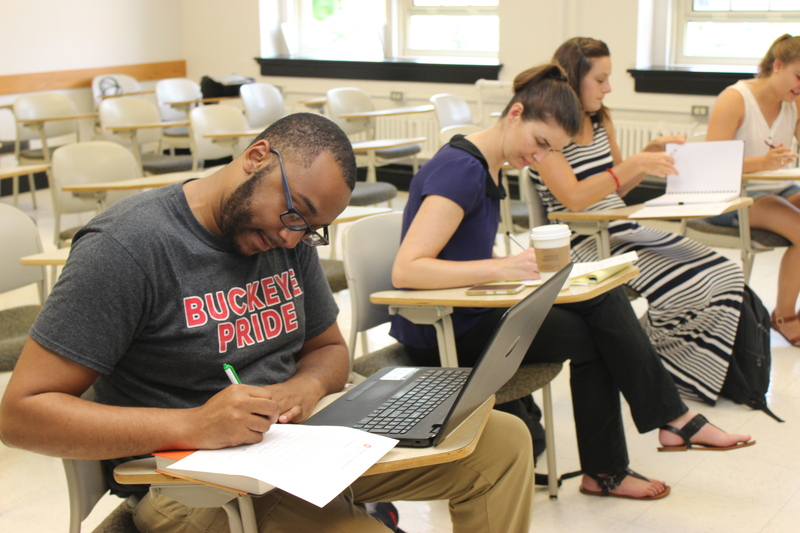 Check out the Counselor Education faculty to see why they love being Buckeyes!